There are many online programs that promise results. Very few deliver. Despite their length of 6-12 weeks. The Strength and Mass Holiday is a mere 5 days. And it delivers. Consistently. Adding 3-5kg leanmass and loosing 2-4% is consider normal. Just ask someone who has done it before. So what is the Strength and Mass Holiday? The Strength and Mass Holiday is a short, high-frequency training program that shots for 10 different workouts in 5 days. Its a great program to be done when you have time – like during a holiday – or when you need results fast – like before a holiday. High-frequency training programs have been around for a while, with the Bulgarian Nationalteam in Weightlifting being the first to popularise such training in the 80s. At the time they were the dominating force in weightlifting. Winning more than half of the available medals at many competitions they entered. On the elite level they trained up to 12 times a day in short 20-30 minute workouts. The capacity to tolerate such training volume needs to be build up over time though. Other high-frequency training programs are the HFT-Program and the Super Accumulation Program which I have used in various forms with general population clients and athletes with great success and which eventually led to the development of the now world-famous „Squat Holiday“, a program that puts you through 18 Squat Workouts in 6 days. With an increase of the Squat Max. of up to 40kg and an average result od +3kg leanmass, -1,5% bodyfat and +15kg on the Squat Max. Then the Squat Holiday eventually led to the „Arm Holiday“, a program that puts you through 12 Biceps and Triceps Workouts in 6 days and is a nice counterpart to the Squat Holiday. The Strength and Mass Holiday is basically a hybrid of these two, calling for 10 different workouts in 5 days with the goal of adding the maximal amount of Strength & Mass in the shortest time possible. I run a version of the The Strength and Mass Holiday at the YPSI, my Personaltraining Gym in Stuttgart, Germany, twice a year under the name of the YPSI Training Camp. Which combines 10 different workouts in 5 days that are build progressively onto each for the fastest gains in Strength and Mass possible. The results of this week match the results of 4-6 weeks of good training. The YPSI Training Camp has been a huge success being sold out every time and attracting general populations clients, personal trainers and athletes from all over europe. With the Strength and Mass Holiday you get the same system, programs and guidance. Just in your own gym. 10 programs with over 30 different exercises with a detailed video on execution and pointers each, detailed individualized Peri-Workout-Nutrition and Food- & Macro-Recommendations with sample Mealplans for 5 days of great training and a big heap of Strength & Mass. All the Best gaining Strength and Mass during this Holiday! 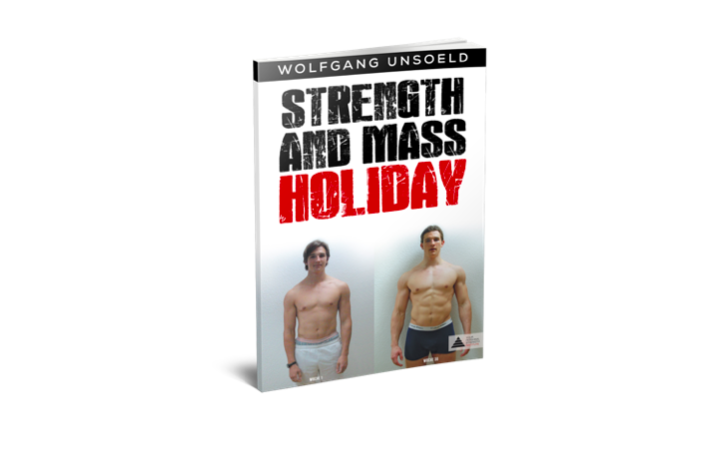 Picture: The cover of the Strength and Mass Holiday Ebook visualized.